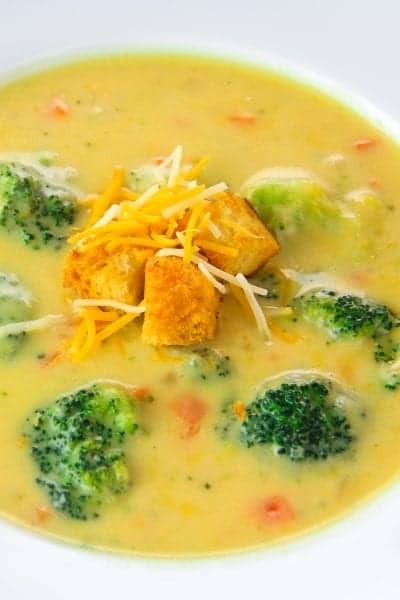 This Copycat Panera Bread Broccoli Cheddar Soup Recipe is full of vegetables in a delicious cheesy cream soup base that will satisfy everyone at your dinner table. In a Dutch oven or heavy bottomed pot, melt butter over medium high heat. Add in the chopped onions, garlic, and carrot. Sauté until the onion becomes translucent. Add the flour and stir just to brown it (about 2 minutes). Browning the flour will take away the taste of raw flour. Once the flour has been stirred for a few minutes, slowly add in the chicken broth. Let the broth simmer for about 15 minutes on medium heat (make sure to stir the soup occasionally). Add in the broccoli, half and half and let the soup come to a boil. Remove the pot from heat and add in the shredded sharp cheddar, medium cheddar, and Swiss cheese. Add salt and stir until the cheese is complete.y melted. Serve warm with croutons or french bread. I recommend buying the cheese in blocks and shredding them yourself. Shredding your own cheese will give you a creamy consistency. If you buy already shredded cheese, it's more likely going to curdle. Also, if you use fresh broccoli, make sure to blanch it in a pot of boiling water for 1 minute before adding it to the soup.